The Foundation uses a disciplined approach to evaluating potential impact investment opportunities ensuring that each investment is aligned with the Foundation’s values, mission and programs. Since 2010, the Foundation is using the Impact Reporting and Investment Standards (IRIS) taxonomy to monitor and evaluate the impact of its investments over time. IRIS is a common language for describing the social and environmental performance of an organization. IRIS data is collected at regular interval from investees and compiled to render the overall impact of the investment portfolio. 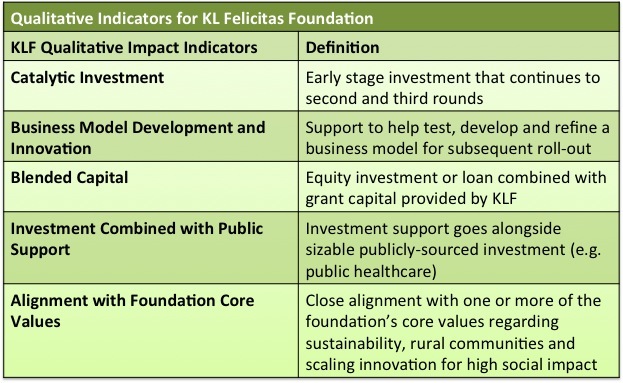 Across the impact investing and grant portfolio, the KL Felicitas Foundation evaluates its impact by monitoring seven key indicators, called “Core Indicators.” Please see the chart at right for more detailed information. 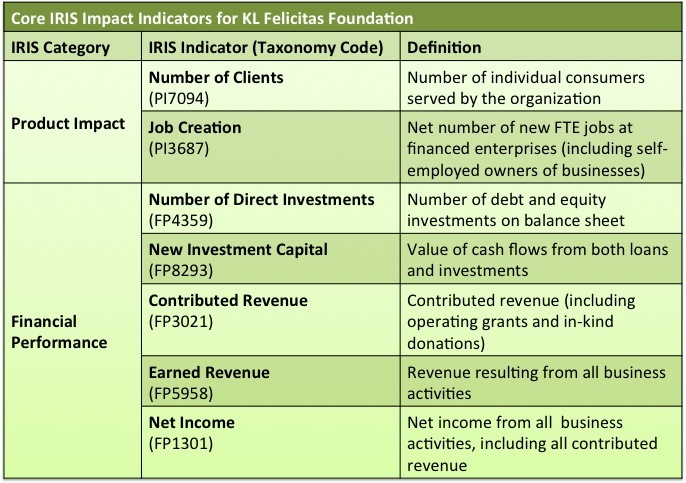 Qualitative indicators, while in many cases anecdotal, can combine with the discipline of the hard data provided by IRIS to render a fuller understanding of the impact of KLF’s investment activities, and in particular to see how and if KLF’s investment helped an organization gain greater scale. Please see the chart at right for more detailed information. While this qualitative data can include some ambiguity, it is KLF’s belief that this type of data, used alongside the IRIS data, is essential to understanding some of the different forces at play that may contribute to an investment’s success or failure. Over the long term (>5 years), the foundation will compare IRIS data with these qualitative indicators to determine if there is any correlation or causal relationship between the two. In late 2009, the KLF investment portfolio contained more than 30 different holdings, sorted by the foundation into various investment types that align with the foundation’s programs and investment and sustainability policies. Among these holdings, various different ‘clusters’ of activity have emerged, most notably health/sanitation/potable water, energy and environmental restoration and conservation. 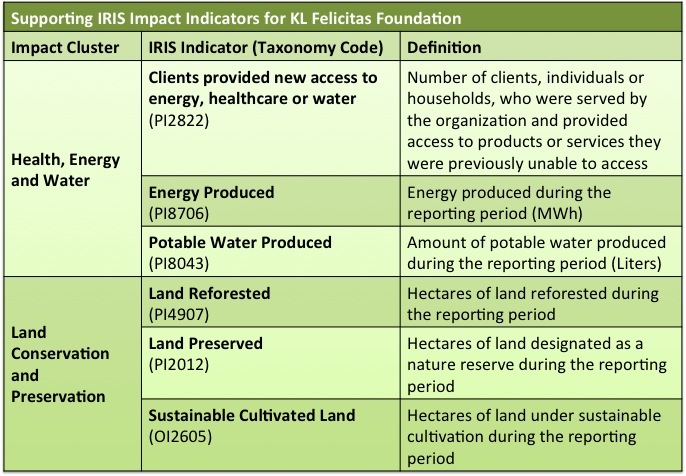 Starting in early 2011, KLF will begin collecting IRIS indicator data, internally named ‘KLF Supporting IRIS Indicators’ for each of these impact clusters in the foundation’s portfolio. Numbers in parentheses reflect the IRIS taxonomy's code for each indicator.